TechGig.com is the world’s first technology-specific, customisable, career portal, exclusively for people in the IT Sector to enhance their employability and professional growth with useful tools, while staying updated of the latest happenings in the industry. TechGig.com not only provides through the best technology jobs exclusively posted by top employers in the sector, but news, blogs, and buzz across the industry. Using TechGig.com, a technology professional can apply for jobs, personalize their tech space, learn & grow professionally – all on one site. Professional Growth- Technology professionals can look for current hiring trends in Tech industry, read real time technology news and blogs through Google News/Blogs API and view relevant Information sourced from third party sites such as Wikipedia, Twitter, eBay (Books), Certifications. All this would leave them with a more holistic, career related browsing experience on TechGig.com. Open Platform– Technology professionals can leverage their resumes with TimesJobs Connect to apply to Jobs, add their own content feeds, news and blogs. Benchmarking– Technology professionals can see which top skills in demand currently, get to know how much their batchmates are earning and in which industry, post their resumes for employers and more. Premium Jobs– Deliver technology jobs from top employers.Technology professionals can also get email updates for new jobs being added on selected key skills or by companies that they choose to ‘Follow’. 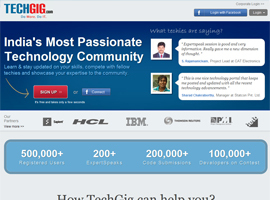 Personalization– Technology professionals can personalize TechGig.com homepage for their own specific key skills, can move and collapse widgets to suit their requirements, share this customized interface with friends, view a comparison with their batch mates on CTC and industry that they are working in. TechGig.com allows users the luxury of tailoring their own technology space, and molding their page into a resource that will allow them to improve their performance, employability, growth prospects and keep abreast of the industry.